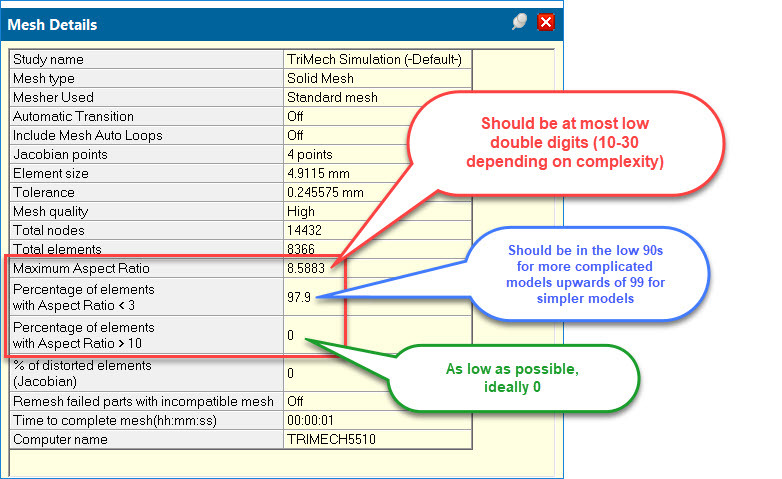 Meshing a model is an integral step in performing any simulation. There’s no getting around it – it has to be done. 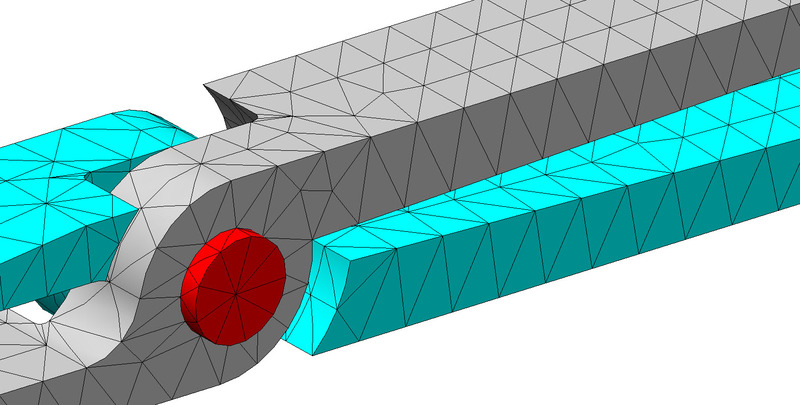 Thanks to many improvements over the years, meshing has transformed from a very tedious, manual process into a quick and easy automated one. Even though SOLIDWORKS Simulation has countless tools and techniques to make meshing as easy as possible, a level of confidence in the resulting mesh can be lacking in even the most advanced users. Is it a good mesh? It’s a simple question with a yes or no answer, and yet we all sometimes have difficulty answering it with confidence. Here’s how to know if you have a good mesh or not. 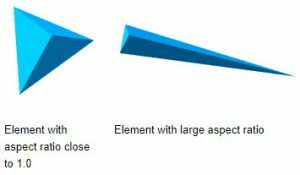 The Aspect Ratio quantifies the quality of the elements, where 1 is a perfectly shaped tetrahedral element and the element shape is worse with a higher Aspect Ratio. You can see this in the image to the left. The aspect ratio is defined as the ratio of the shortest length of the element to the longest length of the element. Since a mesh is nothing more than an approximation of your geometry broken down in to tiny pieces, it is reasonable to have some not exactly perfect elements in your model. 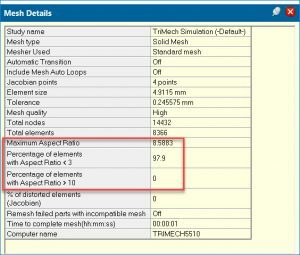 In other words, a good mesh won’t be made up entirely of perfectly shaped elements. A good mesh will, however, have nearly all of its elements with a small aspect ratio or a value less than 3. Although this won’t always be possible especially with larger more complicated models. 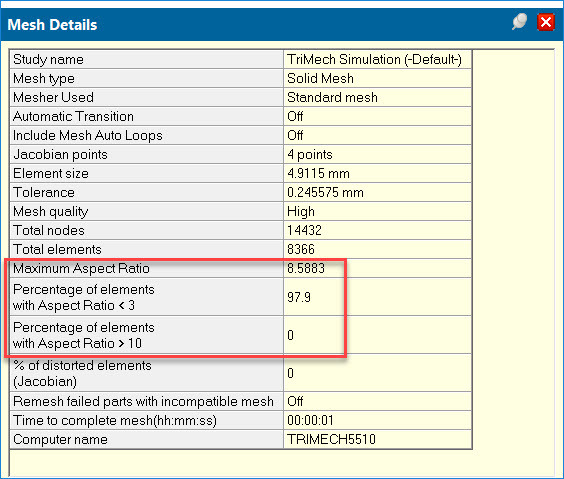 So keep in mind when doing any subsequent levels of mesh refinement it might not be worth the time investment to improve just a handful of elements out of the thousands in the entire model. Also for a quick reference guide to meshing, check out the the meshing infographic below. Since 1998, TriMech has helped our clients design better products by partnering with them and offering, not only CAD, CAE, PDM, FEA, CAM software products, but also by engineering solutions involving full-time and temporary staffing, contract design, analysis and drafting services, rapid prototyping, custom programming and implementation services. TriMech is a value-added reseller of SOLIDWORKS and Stratasys 3D Printers in the Mid-Atlantic and South-East including New Jersey, Pennsylvania, Delaware, Maryland, West Virginia, Virginia, North Carolina, South Carolina, Tennessee, South Carolina, Georgia, Florida, Alabama, Mississippi, Oklahoma, Arkansas and Louisiana.